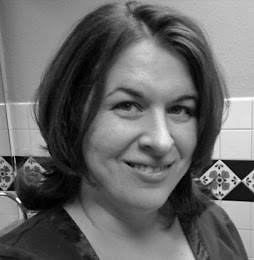 Libby's Little Addiction: Hero Arts Season of Wonder Release Blog Hop + Giveaway! Hero Arts Season of Wonder Release Blog Hop + Giveaway! Hello! Today I'm hopping with Hero Arts as the Season of Wonder winter catalog products are released in the Hero Arts store! You should have arrived here from my amazing friend Lydia's blog. If you didn't, head back to Hero Arts to start at the very beginning! There are so many fabulous new products in this release! I started by playing with the Color Layering Owl. I decided the owl would be a snowy owl today. I stamped layers in Soft Granite and Charcoal, and then stamped the solid layer in Unicorn White pigment ink right over the other stamping, to soften it all. A little pink on the cheeks with pencil, black glaze pen on the eyes and of course glitter to finish it off! The glitter is a fun, new chunky Snowfall Glitter. I created a shaker card, cutting a window with a die from the new Fancy Ornaments Infinity Die set and filling it with new Icicle Sequins. Next I played with an adorable new set - Sending Warm Hogs! For this card, again I began with the Snowfall Glitter. I laid down a rectangle of double-sided adhesive, and sprinkled it with the glitter. So pretty! The little pig was just stamped and colored with my Copics. A message from the stamp set was stamped underneath. Now it's time to hop! Be sure to comment on every blog in the hop, two lucky winners will be drawn from the comments to win a $50 shopping spree! Leave your comments by Sunday, August 26 at 11:59pm. The winners will be announced on the Hero Arts blog. Next stop on the hop is the fabulously talented Laurie Willison! Or here's the entire list if you need it. So fabulous, love them both, especially the piggy one...love that glitter too! AWESOME creations! I especially love the owl shaker card! Great cards! Love the snowfall glitter and that cute piggy. Okay, how I needed that owl! Great card! I Love the glitter on the piggy card too! Fun! The little piggy made me laugh; too cute! I love, love, love that owl! Such great cards. Really love the shaker card. Your cards are so beautiful and the pig is so stinkin' cute!! Love the glitter! These cards are so fun! I think the Snowy Owl would be really fun to work with. I love your card. Love your cards, they are really beautiful, and cute (that pig) :) Thank you for sharing. Hee hee. 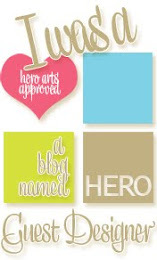 Cute sentiments and subject matter from Hero Arts. 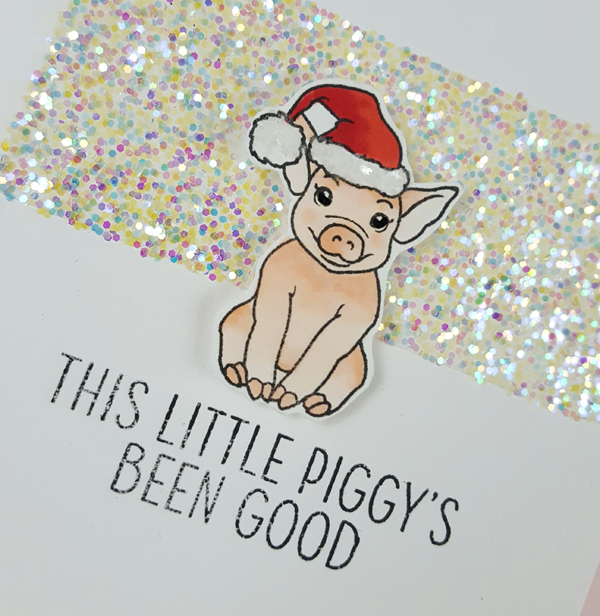 Love your holiday cards, especially that cute adorable piggy. I love your cards today, Libby! The owl has me thinking of our upcoming trip to the Harry Potter park, and that piggy! He is SO CUTE! Love that sparkling glitter strip! This made me smile! The first card is stunning and the second is SO DARN CUTE! Always a fan of the sparkle! The owl card is my fave - love how you paired him with the ornament and made it a shaker. I like the little piggy card, especially the sentiment. Love both your cards..Especially the little pig!!!! Beautiful cards, the pig is great. That pig is so adorable! Libby, your shaker cards are always SO pretty! And you know I adore that divine swine. Thanks for the pretty inspiration and hop invite. XOXOXO! That pig is amazing :D Beautiful cards. Love the piggy and owl!! The piggy card made me smile. Thank you for the idea of the glitter background. I really like your snowfall glitter idea AND that piggy is adorable! Wonderful cards Libby, loving the glittery goodness on both!! I really love the owl card, but the piggy made me squeal. I know just the person who would love this card. I can see a piggy set in my future. Thanks for sharing. The little piggy card is cute- But that owl card shaker is elegant! Your cards are adorable ! The owl is really beautiful, maybe a stamps set I should get.... LOL ! And of course, your little piggy is really cute. What great cards! I especially like the snowy owl and the fancy ornaments infinity dies! Beautiful cards. I love that piggy -- adorable. Lil Piggy is so cute.!!!! love the elegant owl, and definitely had giggles over the silly pig! too cute! Very cute cards - love how you used the fancy ornaments die and icicle sequins. Aww, cute owls and piggies! Cute cards! Love that snowfall glitter and how you made it the background for that adorable piggy!! Love your cards! The owl is beautiful and the piggy is adorable! I love the sparkle! Great little piggy! What beautiful cards. The cute little pig and the awesome owl. Thanks for the glitter and ideas. Sweet cards! Cute pig! Love the release! Hello Libby, beautiful cards! I really like how your owl card look. The Unicorn white pigment ink is one of my favorite. I need to add the charcoal and soft granite ink. Thanks for sharing your design. Your cards are so playful and joyful! Can NOT believe how cute the piggy card is. Wow. Such sweet cards! Love the shaker card and the fun panel of glitter you added behind the pig! Sweet cards and love the glitter panel. That piggy card is so adorable! I like the glitter background, too! Love that gorgeous snowy owl! And the piggy card is absolutely adorable! Lovely creations! Thanks for the inspiration! fantastic cards, Libby - that owl is gorgeous and the piggy so cute! I love both your elegant and whimsical card design. All the sparkle is fabulous! What fun cards, so enjoyable. Thanks for sharing them on the blog hop. 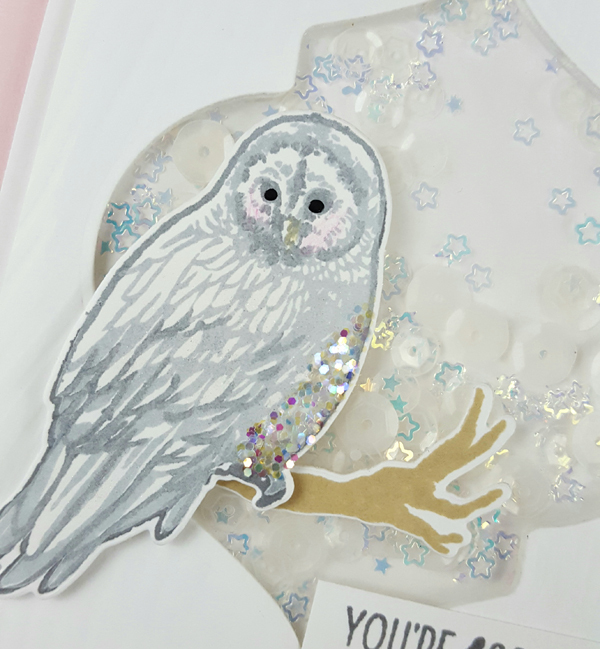 Your snowy owl card is beautiful but that piggy in a Santa hat is adorable too! Owl fan here! Beautiful cards! Ha, I hate to say it but that little piggy looks naughty! Just darling cards. Thank you for the inspiration! Just lovely designs. What a great idea of using the glitter as highlights. They're both great cards! Who can resist sparkle shine and CUTENESS? The owl is stunning! Great color choices. Bring from Arkansas, I love the pig card. Woo pig soiiii!! Razorbacks! Both cards are stunning!! The use of the glitter and the shaker card is perfect. I love the soft colors!! Excellent!! The owl card is gorgeous! Cute little hogs! Make a simple little card! Such cute cards! Love the little piggy and the owl is really regal. TFS! 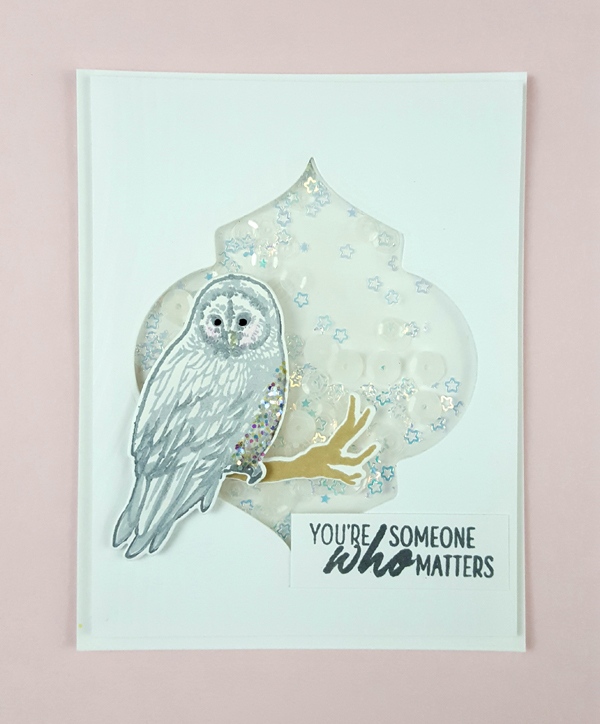 Elegant & humorous, two fabulous cards, your owl looks very majestic with his snow backdrop, gorgeous both of them. Awe, the piggy is so cute and the owl is lovely. Both cards are amazing! I love the owl card! The colours used are perfect with the touch of glitter to make him pop! I really am a sucker for shaker cards! Of course that little hog is just adorable--I love it! But I'm captivated with the owl shaker card--stunning!!! There is just something about owls that always makes me stop and look again, and you captured him beautifully with the sparkly shaker background! Thanks for sharing and have a great day! 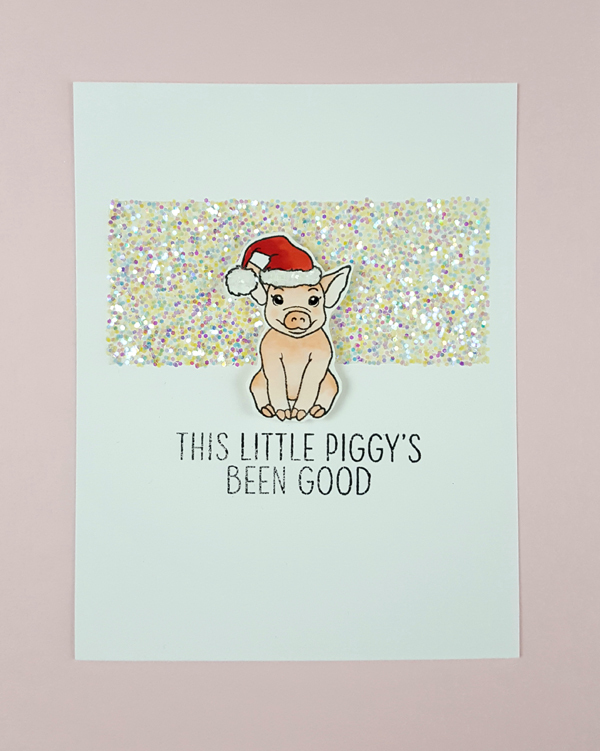 That piggy IS being good - especially as a cute focal point of that card. I love the snowfall glitter as well. Really adds a nice dimension. Aww, what a cute little piggy set. 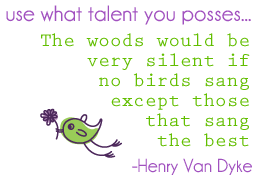 I also love the uplifting owl sentiment! I really like all the sparkle in your cards. The owl stamp is gorgeous and stole my heart! Like the Owl & shaker style as well as the cute Piggy. We have a Barn Owl that comes to our backyard in the late evngs. Have seen it perched on our fence as well as swoop to get a mouse/rat in yard. You don't see that many realistic, beautiful owl images, but this Hero Arts Colour Layering one is stunning. I love that you did a snow owl and shaker card. Perfect. Your little hog card was really cute too. Thanks for sharing. Libby, I love, love, love owls! But I have to say I can't stop smiling over that little piggy. Great cards! Wow, I just love the owl card. So effective. I love the shape of the ornament die. It could be used year round for shaker windows! Fabulous cards! That owl is just gorgeous! so pretty and cute. I like the colors and the sparkle. Cute cards--and I love what you did with the glitter...I'm going to have to try that technique! I am in love with your owl shaker card--then I saw that cute little piggy--adorable! Thanks for sharing. Save worthy cards for sure! I am a HUGE hootie owl fan and I LOVE what you did with your owl and his sweet pink cheeks! Thank you for sharing! What fun cards! So many wonderful new products this release. I love that owl!! Love the glitter! Can't wait to get my hands on that owl to make Harry Potter themed cards. Elegant and fun cards. Such beautiful and creative designs. Fabulous! Ok, these are awesome. I love your little pig card! He is so adorable. Awesome cards... that little piggy is so cheeky looking! OK, the owl is now on my wish list along with the piggy set. I love your use of glitter here! I've only been crafting a couple years and try to send cards every week to whoever I feel needs a pick-me-up. Thank you for the inspiration & chance to win! Love the owl. Your cards are beautiful. Absolutely wonderful! Love the coloring of the owl and the added glitter. Love the piggy too with his glitter background behind him. So cute! Thanks for sharing. Love the sparkly background, thanks for the chance to win. Thanks for 2 sparkling cards. They are both fantastic. I really love your use of glitter and sequins! The snowfall glitter is a must. I've never thought to use it this way but it really makes the card that much more special. The pig is so adorable too. Love your use of the snowfall glitter! I love the glitter behind the cute piggie and on the lovely owl's tummy, too! I love the snowfall glitter. Delightful cards! Love that beautiful snowy owl! These cards are so lovely. Thanks for sharing your creativity. Great cards! All that sparkle … has to be a winner! Thanks so much for sharing!